As we move through life there are always new ideas and exciting developments around the corner each day. They are valuable and move us forward in doing what we do best even better. However, some things are a tradition, and the value they provide is insight and experience by failing forward and improving on what we have done. 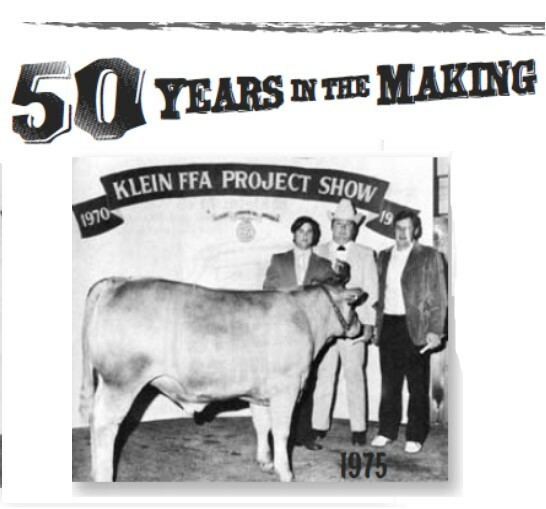 This year we are celebrating the 50th Anniversary of the Klein ISD FFA Livestock and Project Show. I have been proud to work with Klein ISD FFA members, advisors and community members for the past 28 years at this event. With roots beginning under the bleachers at Klein Memorial Stadium in 1968 and moving to the Klein ISD Multipurpose Center in 2011, the show has thrived and grown each year. Providing the students with an opportunity to showcase their projects, from animals to the agriculture science fair, has allowed them to grow as individuals and learn valuable lessons for a lifetime. Thousands of FFA members graduated in Klein ISD with a knowledge of the hard work it takes to be successful in life and help build our strong community. Traditions starting under a set of bleachers by Mr. Ed Hickey and progressing to our 50th Anniversary, February 6-9, 2019, continues the legacy of helping students achieve their goals and reach their dreams. As we look forward to a new goal, idea or task, remember the traditions and what they have taught us in the past, so we can provide a brighter future for our students. Please join us for our celebration starting February 6, 2019 at 6:00pm and ending with the live auction on February 9, 2019 starting at 1:30pm at the Klein ISD Multipurpose Center.